Caramel apples or taffy apples are sweet treats made out of apples coated with caramel and rolled in nuts. A very nice treat to give to the kids who are doing trick or treats this Halloween season, it gives the best of both worlds, the healthy apples and the sugar rush from the caramel. Insert a chopstick into the top of each apple. Place caramel and milk in a saucepan and melt caramels in low heat. Once completely melted remove from heat. Roll each apple in caramel until coated. Roll the coated apples in chopped almonds then set aside by placing it on a greased baking sheet to let it cool and harden. Very pretty finish! Unfortunately we did not have anyone come knock on our door tonight – perhaps because I didn’t really decorate the house… 🙁 I’ve told Mr to take all the candy to work tomorrow. Nice photo. I really like that you added the sliced almonds…sounds great. 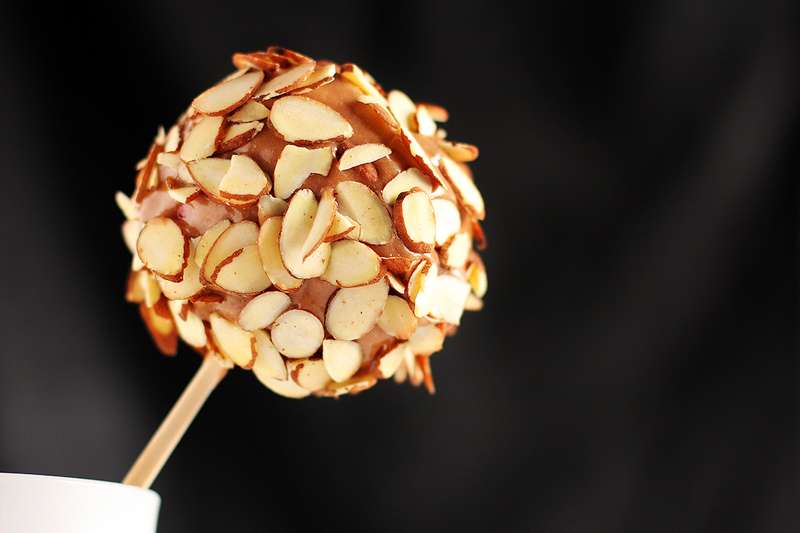 Love the addition of almonds on your Caramel apples. I’m long over due for one of these treats for myself. I’ve always wanted to make caramel apples — this looks too good to eat!